Until Tuesday I loved messy play. It's called messy play for a reason but I don't usually mind lots of paint or water or dirty hands. 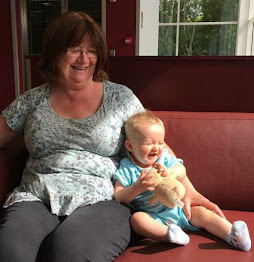 When Bear was very little, less than a year old, I spent many weeks persuading him that paint on his hands was fun and that he wasn't to worry about a few splashes. Just get in and have fun. Lets do finger painting or even better hand painting. Or stamping, I even made stamps out of old kitchen sponges. Then Tuesday came. Bear wanted to do painting. We haven't done painting for ages because we have been so busy with other things. Drawing had taken first place as a craft activity so I was a little unprepared. I didn't put Bear at the head of the table, away from the curtains and walls. He had climbed up on a chair at the side and I just taped the paper to the table. See how easy that is to say. I just taped the paper to the table. Easy. Eight simple words. Most are even monosyllabic. I just taped the paper to the table. What actually happens is that Bear likes to help with the sticky tape. Many attempts are needed to actually secure the paper to the table rather than Bears fingers to the paper. I get told off for helping, or even worse doing it myself. Then the paints are brought out. Just one he only wanted blue. This is his Picasso period. Two minutes later he has decided he wants the other colours. So I turn my back (I know now!) and get out the red, yellow and green. As I put them onto the table I hear "oops" or similar. Paint is dripping from his hand, down the paintbrush onto the floor. I bend down with the kitchen paper I had expertly put on the table for exactly this type of event when he turns to watch this phenomenon and flicks the remaining blob of paint onto the wall behind him. Bear is quite upset by the paint not being where it should be and climbs from the chair to help me. "Not touch" he says as he climbs down only using his elbows and keeping his paint covered hands up in the air, well in his hair and on his face in reality. "Stay there" I say holding a hand up to reinforce my request. Bear climbs back up onto the chair and carries on painting. His colour of choice now is red. Splat, splat, splat. I hear above me as dollops of paint hit the wall. "Stop!" 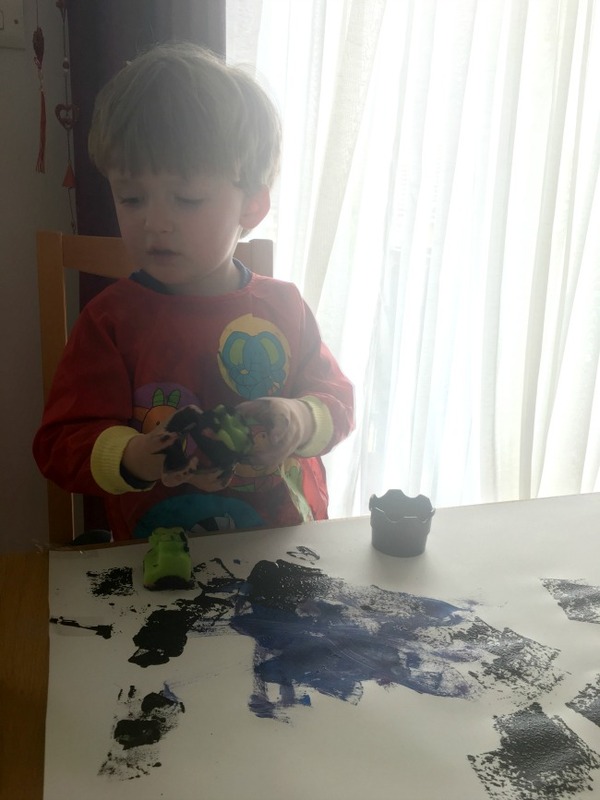 I cry "Just paint on the paper, don't hold the brush above your head"
Bear looks at me and then at the paintbrush and with a subtle flick of the wrist sends splatters towards the wall and then continues with his Masterpiece in Two Colours. I nip to the kitchen, and come back with a cloth to wash the paint splatters away. I am so pleased I bought washable paints, I think, as I see the blue paint smeared on the back of his T-shirt. Bears artist coverall has shrunk while we were experimenting with drawing. Over those few weeks the arms are an inch too short and it doesn't quite cover anything other than a strip at the front. This would be OK if Bear hadn't painted the table whilst I had nipped out and then turned sideways to watch me wash the floor. "Hole in paper" he declares whilst he is vigorously rubbing the paint laden paintbrush over the torn and soggy paper. "Hole"
We discuss at length whether painting is finished but Bear convinces me more paper is needed and more paint. The soggy paper is removed, the table washed and dried and new paper attached to the table. He's off, he now has in his darling little hands our homemade foam stamps and an empty paint pot. "This one" he holds up the black pot. Oh a little won't hurt. I squeeze a little black paint into the pot and put the paint away. Bear knows what to do. He dunks the stamp into the paint and splatters it across the paper. Bear looks at me "Star?" he questions. "You have the stamp upside down" I explain. Oh. A quick turn over of the stamp, black paint dripping and covering his hands and he's off again. I look at my hands, I have black and blue paint dried on them although I haven't been anywhere near the stuff. I look at Bear. He has blue and black paint on his hands, his face, his hair and his clothes. The paper is quite clean with a few beautifully placed black stamps. The table has paint all over it, the chair has a few drops on the seat. "Wash hands" he declares and climbs down. There are now handprints on the chair. 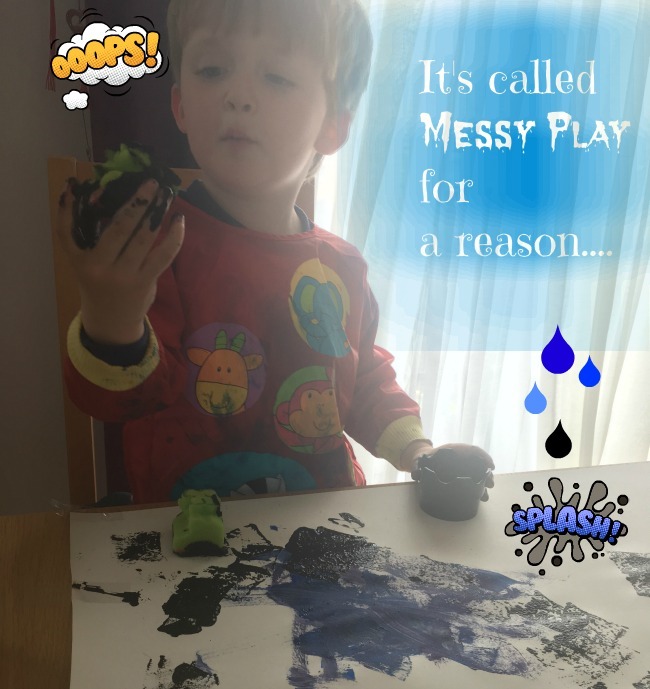 It's called messy play for a reason, messy play is so b****y MESSY! Definitely not prepared - What was I thinking having the light source behind Bear? So glad it mad you laugh. I was so shocked, I've encouraged messy play and had so much fun but this truly was a nightmare!